Rain was once again a threat Friday, June 3rd at the Dacotah Speedway. Luckily for fans and drivers, the rain stayed away. The excess amount of rain the days leading up to race day made for a smooth and fast track. 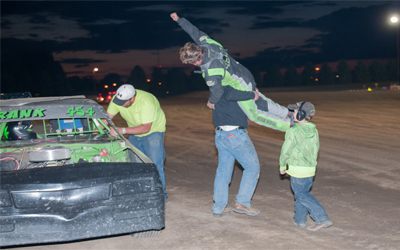 Cautions came early and often in the IMCA Modified Sport Compact feature. As the field took the green flag, last year's track champion,Josh Roehrich was pushed off turn one, bringing out the caution. 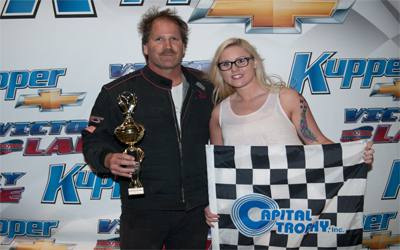 On the complete restart, pole sitter Kayla Koth and Josh Houn raced side by side for the lead. Houn led the first lap before another caution, this time for Chance Seelye, regrouped the field. As they took the green flag, Jason Berg got into the leader, sending Houn off the front straightaway. Berg was sent to the tailand on the final restart of the race, Houn, Chase Schlafmann and Roehrich made contact battling for the lead. Roehrich shuffled in to the lead as Houn, Schlafmann and Dylan Sandberg raced three wide for second. Sandberg muscled his way into the second position before yet another caution slowed the pace.However, track officials called the race short due to drivers exceeding their race time limit. Josh Roehrich was declared the feature winner over Dylan Sandberg, Chase Schlafmann, Josh Houn and Stan Thompson. 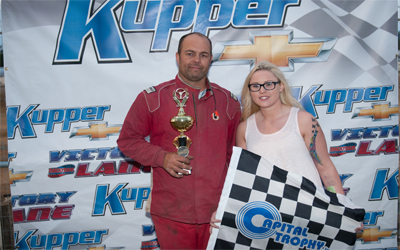 Roehrich hopped from his IMCA Sport Compact and into his second race car for the Hobby Stock feature. 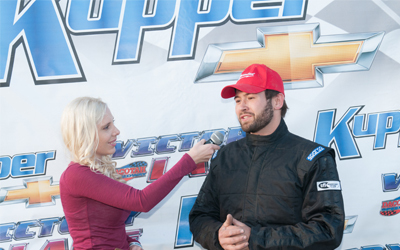 Roehrich took the lead from pole sitter Dylan Thomas as Thomas tried to hold off John Gartner Jr and Jeremy Engelhardt. A lap four caution regrouped the field and on the restart, Engelhardt dove low under Roehrich and into the lead. Engelhardt started to pull away as Gartner Jr started pressuring Roehrich for second. They raced side by side for several laps until Gartner Jr took second with four laps to go. However, a caution with three laps to go reset the field. On the restart, Nathan Messer passed Brent Vetter for fourth. Vetter rallied back but Messer held on to finish fourth. John Gartner Jr held off Josh Roehrich for second as Jeremy Engelhardt went on to win the feature victory. Pole sitter Jon Schumann, Kevin Jensen and Casey Martin went three wide for the INEX Le gends feature. Jensen edged Schumann and Williams at the Open Road Honda finish line to led the first lap before a lap one caution.Williams grabbed the lead on the restart as Schumann had his hands full with Troy Hoff. Hoff advanced to third and quickly caught Jensen. Using the lowline, Hoff slipped by Jensen bringing Donavin Wiest with him. Wiest quickly passed Hoff for second before a series of cautions regrouped the field. On the final restart, Wiest dove low under Williams to take the lead with three laps to go. Williams rallied back and they raced side by side for several laps.Coming to the white flag, Williams retook the lead and picked up the feature win over points leader Donavin Wiest. Troy Hoff finished third while Steven Kuntz made a last lap pass to finish fourth over Preston Martin. Brad Hellman and John Weber started on the front row of the WISSOTA Street Stock feature. Hellman, in only his second season of racing,grabbed the lead as Dustin Frank challenged for second. Using the highline around the track, Frank passed Weber for second and started closing in on Hellman. The momentum from the high line gave Frank the extra speed to pass Hellman on lap six. Weber had his hands full, trying to hold off Matt Dosch and Shawn Becker. Dosch passed Weber and quickly reeled in Hellman. Despite racing hard for second, Hellman and Dosch started to close in on leader Frank. With five laps to go, Dosch completed the pass on Hellman and set his sights on Frank. Dosch was all over Frank's rear bumper but ran out of time. Frank heldon to win his third career WISSOTA Street Stock feature win at the Dacotah Speedway. Shawn Becker finished third as John Weber made a last lap pass to finish fourth over Chris Michaelsohn and Brad Hellman. Jamestown, North Dakota's Scott Bintz led the first lap inthe IMCA Modified feature before a caution regrouped the field. Trying to gain ground on points leader Spencer Wilson who missed the feature, second place in points, Shawn Strand, was sent to the tail. Bintz held off Steven Pfeifer on the restart as Quentin Kinzley, Mark Dahl and Marlyn Seidler raced hard for third place. Dahl found speed alongside the guardrail and passed Kinzley for third. Dahl quickly caught and passed Pfiefer for second but was over two seconds behind leader Bintz. However, Dahl had the fastest car on track, caught Bintz and was all over his rear bumper. As Dahl looked for away around Bintz, Jason Grimes, who started 12th, passed Pfeifer around the highside. As Dahl took the lead with nine laps to go, Grimes was quickly catching Bintz for second. Lapped traffic reeked havoc for Dahl as he made contact with Ryan Wolla, allowing second place Grimes to quickly close in on Dahl. 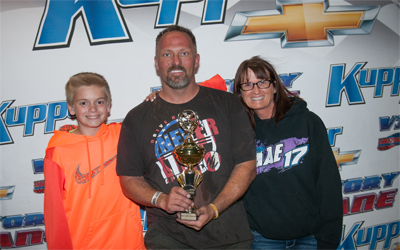 Mark Dahl led the final nine laps to win his first IMCA Modified feature victory at the Dacotah Speedway since 2014. Jason Grimes had to settle for second ahead of Scott Bintz. Steven Pfeifer finished fourth while Aaron Turnbull, who started19th, rounded out the top five. All 5 Mandan Dirt Series Divisions will be in action on Friday, June 10th. The action is brought to you by Planet Powersportz.